BAR LIFT BARRIER | Dock Door Systems Inc.
McGuire’s Bar-Lift Barrier prevents lift trucks from driving off the dock. Hydraulic operation provides years of uncomplicated service for use with mechanical, air operated and hydraulic dock levelers. 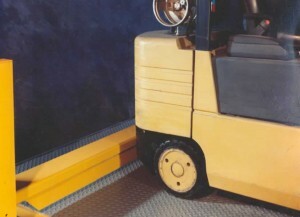 McGuire’s Bar-Lift Barrier can also be installed on docks with no levelers. The equipment is rated to withstand repeated impacts by a 10,000 lb. load moving at 4 mph. Standard units are 12’1” wide and include stanchion, barrier arm, and receiver pocket in safety yellow for ease of recognition. Also available are customized widths and gusseted models to protect the bottom panel of overhead doors.